Right now I’m reading a book by Shane Claiborne called The Irresistible Revolution. Shane is one of the founding members of a Philadelphia-based inner-city ministry/community called The Simple Way (http://www.thesimpleway.org). Fed up with the insulation of white Christian suburbia, Shane and some friends started going on regular trips to the inner city to have fellowship with a group of homeless families who lived in an abandoned church. Notice the choice of words there: they went for fellowship. The only mission they were on was to help protest the forced eviction of these families, but by taking on the literal role of Jesus in spending time in fellowship with them, they ended up falling in love with everyone there and making fellowship with those people a regular part of life. Eventually, they succeeded in preventing their eviction, with the help of several answers to prayer. The book conveys the power of the story much more than any summary I write can, so I certainly recommend it. What I can say, though, from having read a third of the book, is that I have been moved almost to tears several times while reading it because I see him doing ministry and making a difference in the world while I’m sitting here reading about it and “studying to do ministry”. Theology is important, no doubt, but there comes a point when scholarship insulates us from Jesus’ calling in the same way that riches do. For example, take the difference between Matthew’s version of the beatitudes and Luke’s: “Blessed are the poor in spirit” vs. “Blessed are the poor.” While I bet Jesus did mean to bless those who are grieving, mourning, and depressed, I’ve heard numerous people write off this blessing of the poor implying that Jesus only meant those who are poor in spirit. If we believe he only meant the poor in spirit, it’s easy to start thinking that it’s fine to be wealthy and miserly, all as long as we recognize that Christ meets us in our emotional sorrow. That is, of course, a load of crap. But that’s exactly what we feed ourselves when we start rationalizing away the brazenness of Jesus’ message. This morning in Exegesis, Dr. Gagnon talked about how Jesus’ words “Eat my flesh, drink my blood” were intentionally offensive because they were meant to call attention to his exclusive saving power. What do we do with that in church today? Call it symbolism and then forget what it symbolizes, namely the fact that Jesus’ himself is The source of life. So now I am left wishing that I was getting more real tangible experience in ministry right now – both to the poor in spirit and to the just plain poor. That is what my field education will provide in one aspect next year, but since I’ll be working at a fairly well-off suburban church, I’ll surely still be wrestling with these distinctions. Until then, I still admit that I’m not living up to Christ’s calling here – I only pray that God will have mercy upon me until I actually do. Parting thought: in the summer of 2002 I spent two months in Chiang Mai, Thailand. Living in the city, teaching English to college students, we met people who were mostly in the top ten percent of the country economically. Even so, we ate meals that cost only fifty cents each, standard fare for a full plate of rice, veggies, and some meat. Two weekends we traveled out to the rural villages to visit the people who work mostly as rice farmers. 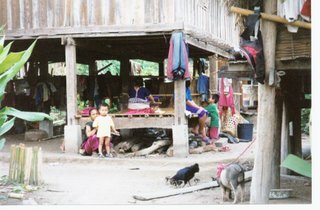 There the kids rarely get more than a third grade education and are lucky if they don’t either go to jail for growing marijuana or become teenage prostitutes in the tourist areas in southern Thailand. Here’s a picture of a typical family. We were some of the first Americans they saw and also some of the first Christians. What sort of message did we convey by showing up with all our digital cameras and multiple sets of clothes? Is that the Gospel? How could we have better represented Jesus to them?